The Lodge is situated in private gardens only 4 or 5 minutes stroll from the village centre and waterfront, a home away from home for your Island experience. 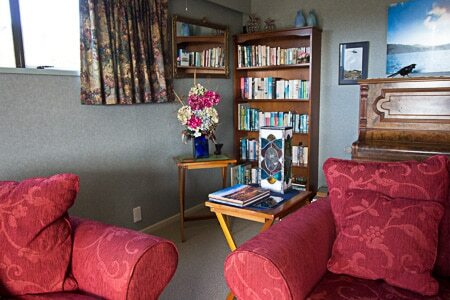 With 4 double rooms upstairs Kowhai Lane can be either a single room booking with shared kitchen/lounge areas or as a whole of house booking for your family or group of friends. All rooms have ensuite facilities so you won’t be queuing for the bathroom. Three are king double or twin and the fourth is a queen. There is lots of room for all with both large lounge and dining room. . 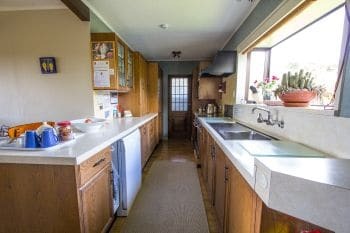 The kitchen is well appointed with all modern conveniences, including a dishwasher. 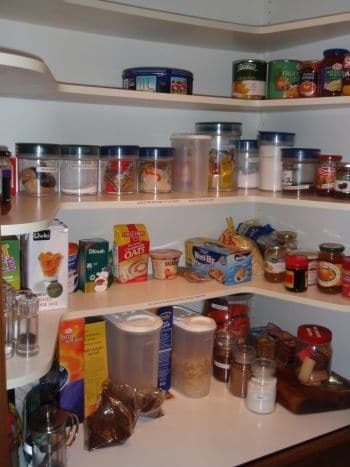 And there is a guest pantry !! Automatic central heating throughout keeps the outdoors at bay on the chillier days. (No coal fires or range to struggle with). Electric blankets ensure a great sleep on the coolest of nights. 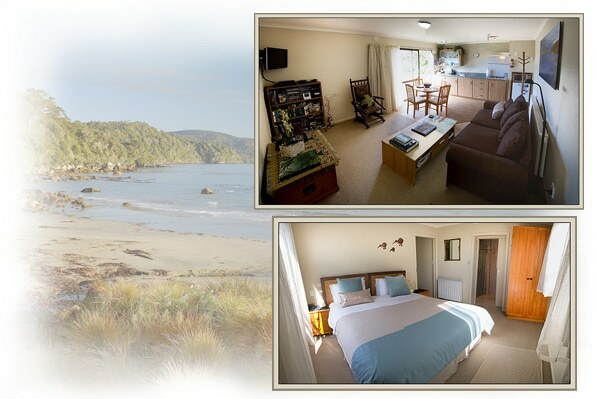 Please note Sails Ashore is two night and Kowhai Lane Lodge three nights minimum stay . Our booking system may not cope with a single guest for the Guided Walk. If not we will refund the appropriate tariff. There will be no hidden extras as all taxes, GST, VAT, “Resort Fees” etc are included in the tariff. 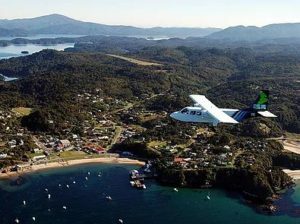 Our Guests enjoy a 10% discount when flying with Stewart Island Flights. Do not use their online booking system as it does not cope with the discount. 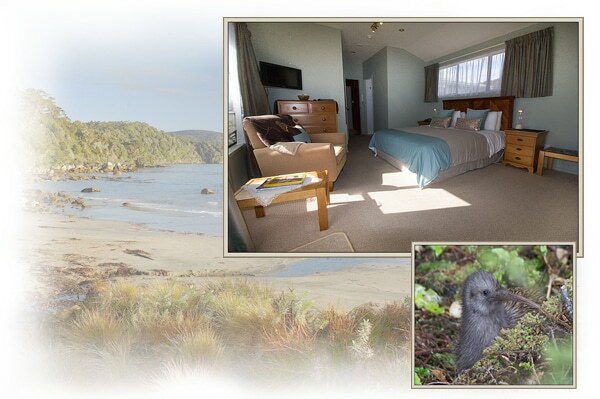 Although we are 3 consecutive nights minimum stay we can probably help guests wanting to enjoy our Rakiura Great Walk and splitting their stay. 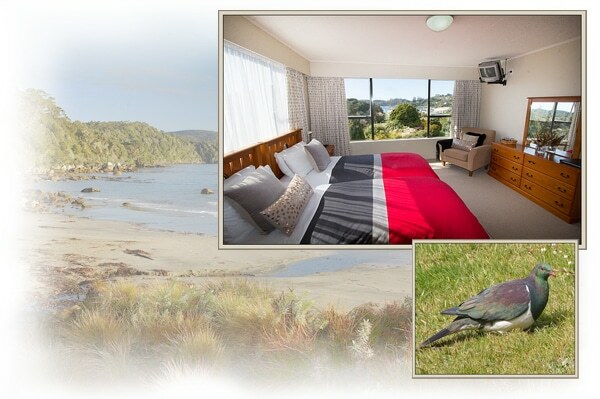 Kereru Room is ensuite with king double/twin bed and electric blankets. 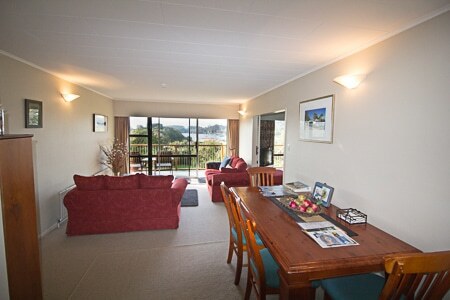 It is centrally heated 24/7 and has harbour views. 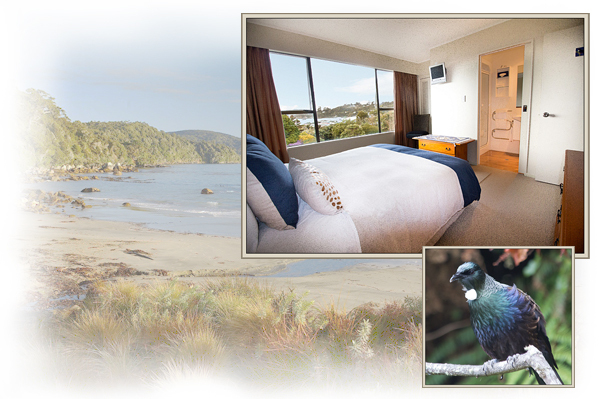 Tui, Kereru, Piwakawaka and Kiwi Rooms share the kitchen, dining and living rooms, as well as a laundry. Kiwi Room is ensuite, with king double/twin bed and electric blankets. Centrally heated 24/7 Kiwi room is garden view. 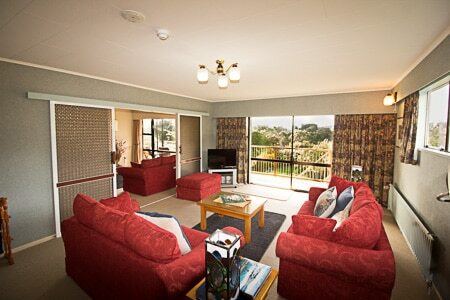 Tui, Kereru, Piwakawaka and; Kiwi Rooms share the kitchen, dining and living rooms, as well as a laundry. Our Apartment is the lower level at Kowhai Lane. It has two rooms plus ensuite, and has a king double bed .with electric blankets and is centrally heated 24/7 with a garden view. Take the whole house plus apartment and you’ll enjoy a great discount. Kowhai Lane Lodge is 3 night minimum stay and a “Sails” guided exploration of Ulva Island is a must do and is part of the Kowhai Lane package. As we generally restrict party size to a maximum of 6 you will be really involved. The local walks are a relaxed way of exploring the forests and beaches the community nestles amongst. Thank you both for a wonderful stay. 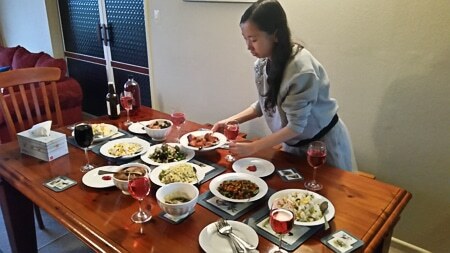 We will never forget the warm hospitality of Iris & Peter. Peters guided tour of Ulva Island was top notch ! We learned so much!. We especially liked how he pointed out little details about plant life we sometimes forget to look at. We bought our 5 month old son along. Iris was excellent. On arrival she had the heat turned on, some toys and the towel racks on. All their attention to detail and information was excellent. Overall, Fantastic !! Thank you for welcoming us to this rugged and beautiful place. You have been perfect hosts, taking us wherever we wanted to go, and telling us about the flora, fauna and local history.. Ulva Island was beautiful as were the gardens at Kowhai Lane. Many thanks for your generous hospitality. 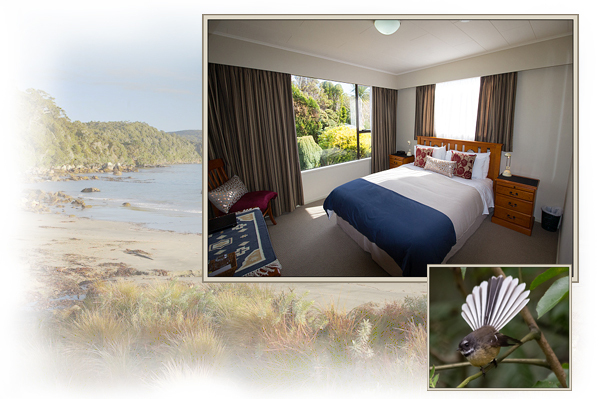 We thoroughly enjoyed the guided walk around Ulva as well as the very comfortable surroundings here at 6 Kowhai Lane> If we ever get the chance to visit New Zealand again a trip to Stewart Island is a must. A fabulous base from which to enjoy the delights of Oban. Also managed 4 species, but alas, no Kiwi. We Loved our time here on Stewart Island, and the two of you made it really special for us. 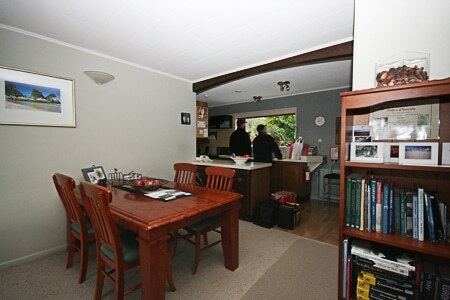 We are almost at the furthest point from home here at Stewart Island, but we feel like at home in this beautiful house. We loved the tour of Ulva Island with Peter and all his explanations and histories about the plants and birds. That was fascinating. Keep the beautiful energy you have. Thanks for everything and who knows … maybe we see you another time. We include Complementary transfers from plane and ferry on arrival and departure on the Island, but please do note if coming by ferry that wharf parking is limited, and also delays in unloading luggage from the ferry can result in significant time delays, sometimes as long as 45 minutes from arrival to collecting your luggage. So while we will pick you up we do ask that you phone us on 03 219 1151 once you have your luggage in hand. 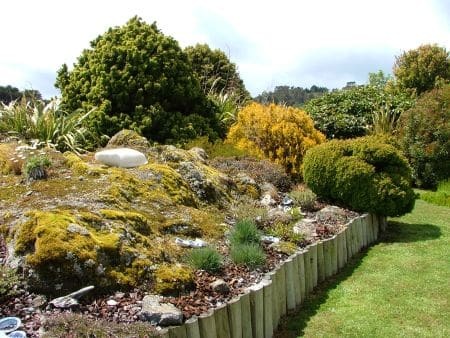 Kowhai Lane is your ideal base to explore the Island. “Get your bearings” with a “Sails” Scenic Road Tour . “Sails” party sizes are small and guests enjoy complimentary transfer plus a discount off the listed price. You’ll also leave with a free DVD containing a short film and slide shows about Stewart Island. Pay for use WiFi is available throughout the house and grounds .